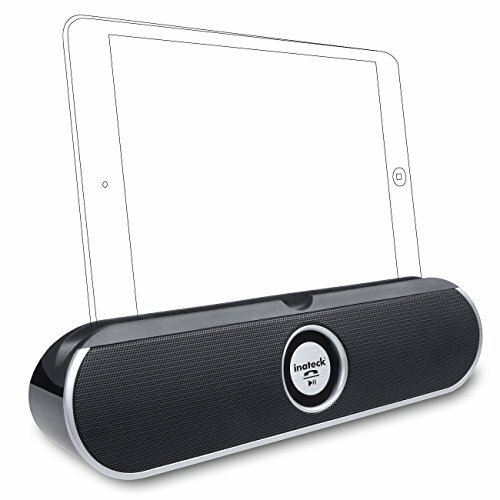 Portable Wireless Bluetooth Desktop Speaker For Convenient Listening Technology Meets Design A simple, modern design and compact dimensions paired with crystal clear sound. The speaker design itself optimizes space to maximize the speaker size. Durable & Secure Made using sustainable environmentally friendly ABS plastic the retractable stand firmly holds your device at a comfortable viewing angle for easy use while two robust rubber feet at the bottom firmly secure it and prevent vibrations caused by loud audio. Superior Sound Supports any kind of media playback: music, games, movies or net-based media streaming. Intelligent audio technology prevents distorted audio frequencies for crystal-clear listening. Dual-connection in Both Wired and Bluetooth Connect with any Bluetooth-enabled device or just plug in with the traditional 3.5 mm audio cable to begin. Compatible with iOS and non-iOS devices. It also supports Macintosh as well as Windows PCs. Specifications Supported wireless modes: Bluetooth and EDR Signal distance: up to 10m (signal conditions may vary or be less favorable due to interfering signals) Battery: Li-Ion cell, capacity -> 800 mAh Effective performance: 5 Watts x2 Measurements: 240 mm x 62 mm x 41 mm Please Note: 1.There is NO volume controller on the speaker. Volume must be adjusted via the connected device. 2. This speaker can not be used as a charging dock to charge other device.